Summer is almost here. That means road trips! Lots and lots of road trips! What road trips do you have planned this summer? I am almost in my third trimester of pregnancy (yay!) so I won't be doing much traveling this summer. 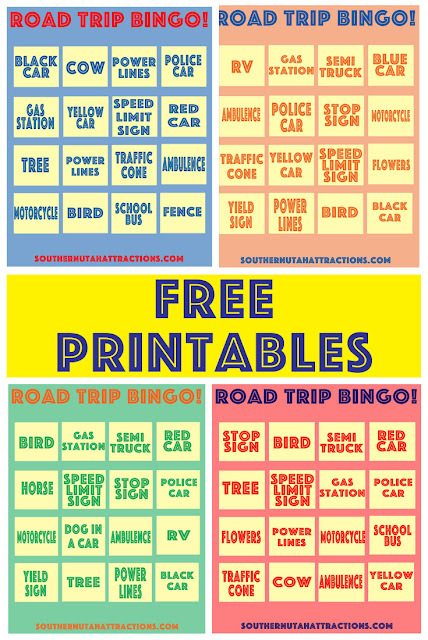 When I was little I remember having a road trip bingo game that my mom bought my brothers and I. It was the perfect thing to keep us entertained during the long road trips from Colorado to Utah to visit our family. I've made this free printable for you to keep your little ones (or big ones) entertained this summer no matter where your travels take you. There are 4 different boards in this printable. If you laminate them and give your kids some dry erase markers or something to cover the squares you can use them over and over! Click here to download a PDF of the bingo boards.